What ranks highest on your fear list? Is it death, snakes or maybe public speaking? 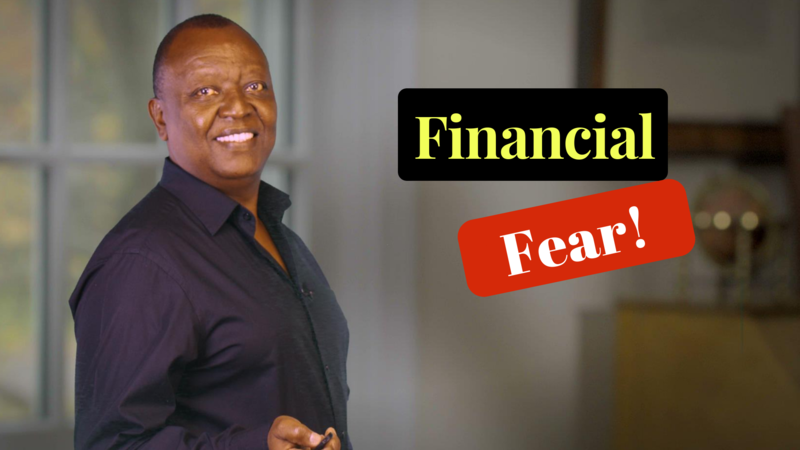 For most people, financial fear is one of the unspoken and often unresolved fears in our lives. Today, we explore financial fear and how you can resolve it and live a less stressful life. Please CLICK HERE to watch on You Tube. Chances are, whether you know it or not financial failure ranks high on your fear list. There is a good reason for this: money can have a profound and inescapable effect on all aspects of life. It is a well – known fact that with out some measure of certainty over how one will pay for one’s needs, it is difficult to cope with family and societal obligations responsibly and adequately. Financial failure usually results from loss of a job, inability to work due to ill health, collapse of a business or as result of making mistakes with one’s money because of ignorant or irresponsible management. A tiny fraction of the general population attains enormous wealth, usually through ownership of successful business. But few have the talent, resourcefulness or sheer tenacity needed to achieve such heights of success. There is another class of people whose income, whether from employment or business, is not particularly high and they do not possess any special talents. Yet somehow, the people in this group seem to live uncomplicated lives, own reasonably good homes, educate their children and end up comfortable and secure when they grow old. Although the dream of becoming super-rich may be very alluring, for most people, it is more advisable, and more productive for you to aim for achievable goals rather than chase elusive mirages. The very fact that these people, who are just like you and I, can achieve financial security indicates that they follow principles that work. Please CLICK HERE to watch on You Tube. To manage money successfully, one must plan finances, control their level of debt, use debt responsibly, save and invest. Uncontrolled debt is a major cause of financial fear. Controlling one’s level of debt has intrinsic, material as well as personal benefits. The first benefit is security. When you are not overburdened by debt, the threat of your property being auctioned to pay creditors does not hang over your head. This reduces personal stress. It is often said that financial difficulties contribute to the development of stress – related illness and marital difficulties. Materially, an individual with a low debt level is able to accumulate more items or save more for the future. This is because the money that would have gone towards interest payments is freed up and can now be more productively used. Another benefit is that you will be able to qualify more easily for financing for important things such as a house mortgage when you have a low debt to income ratio. Personal benefits are numerous but for many people, the most important is that they feel free and in control of their lives. This is the opposite of being chained to repayment schedules, working month after month for your creditors rather than yourself. Making responsible use of credit requires an understanding of when such debts are appropriate. The first aspect of this is whether one will be able to make the required installment payments without interfering with the savings plan. As a rule, total monthly debt repayment, including mortgage should not exceed 36 per cent. The next consideration is the reason for borrowing. In general, it is more advisable to borrow to pay for things that appreciate or that enable you to increase your income. Borrowing for a house, university education or for business is fine if prudently done. These prudent people also plan for their family’s financial needs way ahead of time, in fact someone once said that rich people plan for four generations to come while poor people plan for Saturday night. Start saving and investing for your newborn’s college education right away, for deposit for your house years before you are to buy and for your retirement right from your first salary. This does not mean you live a misers life, what it means is that you use a budget to control where your income flows to and make deliberate choices. Your budget should reflect the balance in your financial life including all the planned expenditures, including entertainment and your savings. Your savings should be channeled into investments appropriate to your financial goals. Investment is not a goal by itself, rather a mean to achieve a goal. Make sure you understand the any investment you put your money into or you seek the advice of an unbiased professional advisor. Never follow the investing crowd blindly, you may end up finding out too late that the crowd you are running with are sheep being herded into the slaughterhouse. Even in well planned lives, unpredictable things happen and they can devastate even the most valuable portfolios. The first line of defence is an emergency fund of between three to six months expenses. Protect yourself and your family from the bigger vagaries of fate by purchasing the appropriate insurance covers including health, life, property, personal liability and disability covers. Think about the unthinkable by preparing a will. A will significantly reduces the trauma that survivors undergo when their loved ones pass away. People who earn an average income, live a down-to-earth lifestyle and have no dazzling talents, yet succeed, follow these basic principles whether they know it or not. Again and again, they prove that one need not earn a huge salary or own a chain of businesses to live well. Plan your finances and banish financial fear from your fear list. Please CLICK HERE to watch on You Tube.